You may have read our blog post a few months ago about “Force Monitoring for Research and Testing”. 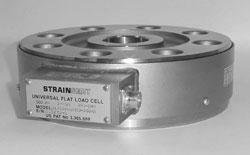 Strainsert Load Cells are also very commonly used for Measurement and Control Applications. What is meant by a “Measurement and control application”? Unlike the Research and Testing category, the Measurement and Control applications for load cells don’t involve new or existing hardware design or testing. Measurement and control applications are the types of applications you would expect Load Cells to be used for. In these applications, the load cells are used to control the force which is being applied to ensure that the desired force is achieved. This is either done by direct monitoring or by integrating the force into a complete feedback automated system. Load cells are also used in measurement and control applications to monitor forces during operation. Load cells can detect if a scale is overloaded and will alert the system keeping conditions safe. Measurement and Control Application Examples. What measurement and control applications use load cells? The examples we have are from our supplier Strainsert. Strainsert load cells are used in these types of measurement and control applications regularly. These applications use load cells to either ensure that the process force is applied or to ensure that the application does not exceed the maximum force. You can take a look at all of the load cells we offer from Strainsert by visiting the load cells section of our website here.